The story goes that at the launch of the first issue of Poetry Ireland Magazine, back in the early ‘60s, the young Michael Hartnett criticized Patrick Kavanagh for using the word garage in a poem, and Kavanagh became very angry, upending a table of drinks. What would Michael have thought of a poem with the word Rinse-Aid in it? Kavanagh hefted a literary round. many, by Heany-echoing poets, since. are replicated for poetic kudos. would fit in that County Monaghan garage? the garage out of Patrick Kavanagh’s poem? 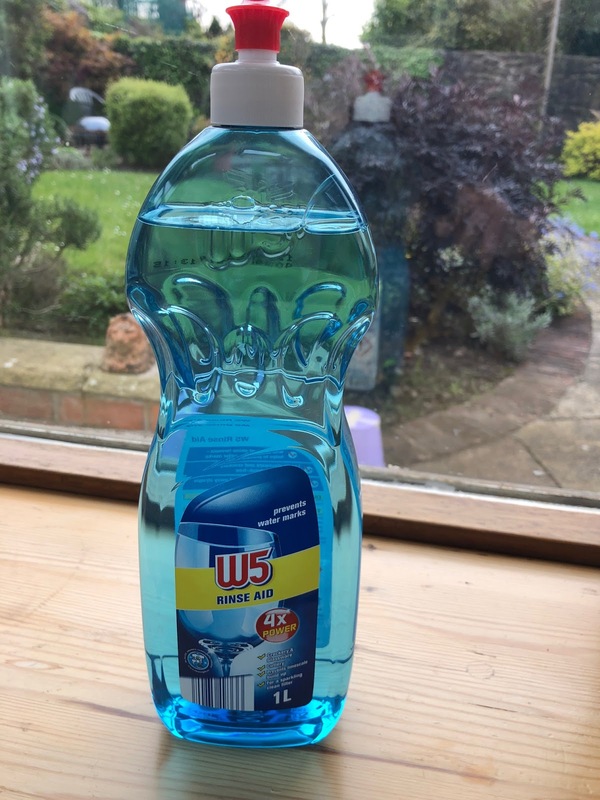 groping at bottles, looking for Rinse-Aid. Following the successful launch of two of our Irish titles in Limerick last month, we are pleased to announce our first event in Dublin: a launch of all the chapbooks and full collections that SurVision Books have published so far. THE LAUNCH AND READING WILL TAKE PLACE ON SATURDAY 12th JANUARY at 2PM (14.00) in PEARSE STREET LIBRARY, 144 PEARSE STREET, DUBLIN 2. CONVERSATION STARTERS IN A LANGUAGE NO ONE SPEAKS by Bob Lucky (USA). 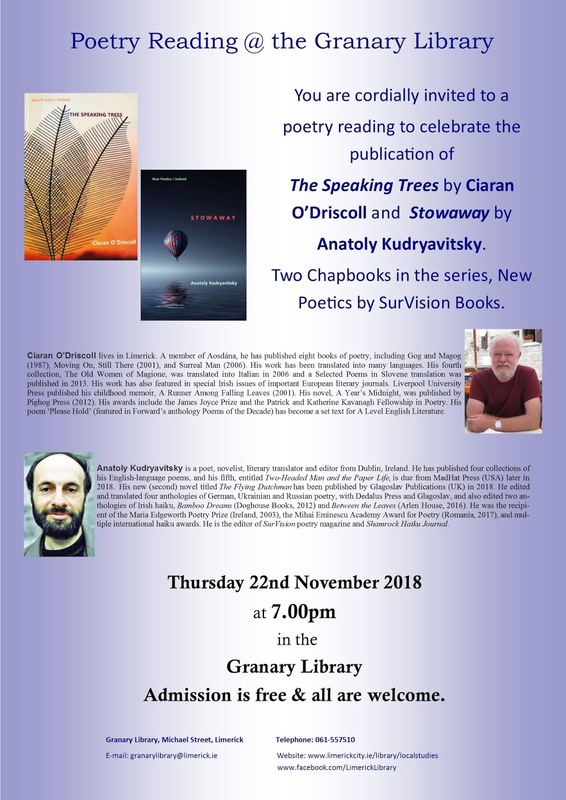 All eleven Titles (Poetry Chapbooks and Full Collections) published so far by SurVision Books will be on sale at the Event, at special prices. I have often observed the Spleenwort plant, pictured above, on my I boundary wall. It looked wretched and rustily withering all through summer and autumn. 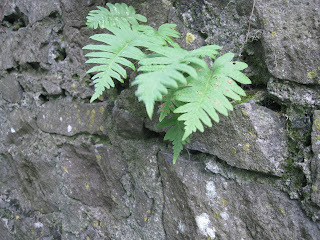 It's only in the last few weeks it has grown fresh fronds. This is a plant that seems to come into its own in the heart of winter. Spleenwort is apparently so called because it was formerly thought to be useful in curing or easing disorders of the spleen. In November, many people tend to be more splenetic than usual, having had their good weather taken away from them, like candy from a kid, while the nostalgia of Christmas and its culinary comforts have not yet established themselves, despite the flooding of TV screens with Yuletide images. This week's storm heralded the arrival of the dúluachair (winter weather). Were it not for the promise of Christmas feasts and holidays, Diana would have put anyone off his game (no pun intended). But January tends to be more trying than November, in my experience, because of the fact that there's very little to look forward to, for a long stretch, once the celebrations are over and the Christmas tree consigned to the Corporation for mulching. My poem, 'November Days', was published in Cyphers No 85, which came out in the late spring of this year, so I thought I might give it a more weather-appropriate airing here in my blog, after the first storm of the winter. Hopefully, we will soon be distracted from the dúluachair by the lúcháir (joy) of Christmas. Parsley pales. The cat craps in the flower box. an icebound working group on climate change. when blessed with water. Christmas rules TV. no longer deafens us with power tools. each finger-lobe a blister-strip of spores. The literary magazine Cyphers inches towards its hundreth edition, and I wonder will I be alive to see it? Fourteen issues to go. At two issues a year, I might make it! 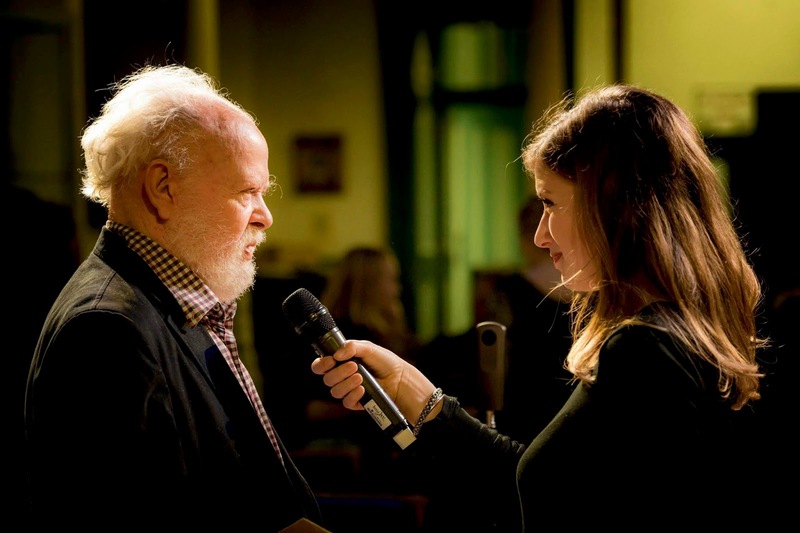 Cyphers has outlived all but one of its original editors. Pearse Hutchinson and Leland Bardwell are gone, and most recently gone is Macdara Woods, who died in June. 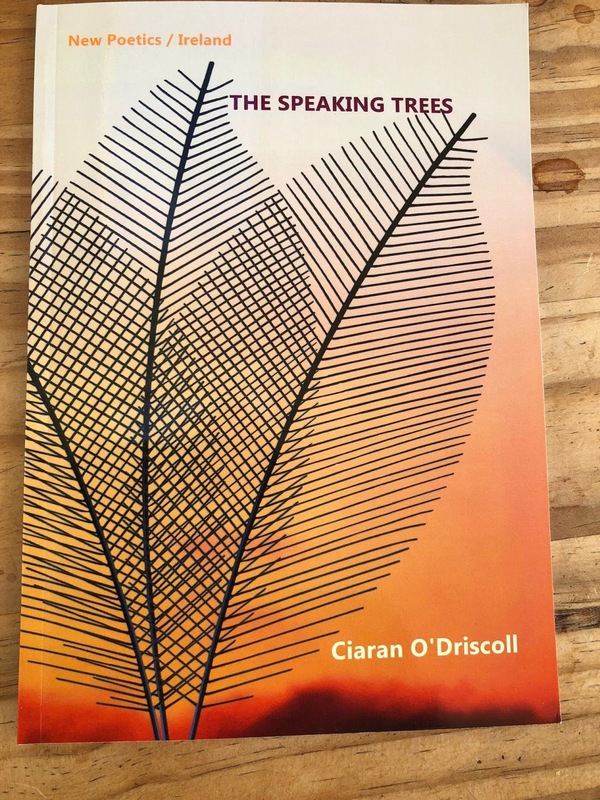 Eiléan Ní Chuilleanáin is the remaining editor, and, as the acknowledgements say, she is assisted by Natasha Cuddington and Léan Ní Chuilleanáin, with Joseph Woods as consulting editor. Why has the poetry of Macdara Woods been met with such indifference in our little country? Even at their best, reviews have been less than glowing, carefully hedged with qualifications. It seems to bespeak a fear among Irish poets of upsetting some dictatorial presence by endorsing Woods' frequent Neruda-like forays into the risky realms of injustice, oppression and other deep-rooted evils of humanity: the arenas where poetry seeks to parley with that which is grave and constant in human suffering? The Ticket, 17/11/18, italics mine). So what are we to infer from this? (1) Tenderness itself will make an ecological point? (2) References to bleach and detergent pollution are unaesthetic and take away from the poem? (3) References to bleach and detergent pollution are uncomfortable because they hint at ecological disaster, and make us uneasy in our political and social inaction? I am all for the 'soft' content of poetry, but surely poets ought to address the 'hard' content too? I have also often wondered why Cyphers is not held in greater esteem, remembering the rather patronising remark of an otherwise supportive former Literary Editor of The Irish Times: 'Good old Cyphers'. I think the failure to give this magazine its proper reputation is because of its modesty: it does not tell you in advance that these poems are 'exciting', 'heart-stopping', 'delightful', 'fit to die in'; nor does it distinguish between the famous and the unfamous by opting for the big names before others. It simply places the poems before the reader to make of them what he or she may, to be judged on their merits, to take or to leave. But perhaps (and I hope) the dependably revitalizing contents of Cyphers will come into their own when people get heartily sick of boasting and oneupmanship, and eventually come back to their senses and make their own judgements; when an ethos might prevail where readers are allowed to be 'love-struck by a loveliness/ of lines, won over by a spell of stanzas' rather than being told vociferously what they ought and ought not to be reading. On the sociology of absences. And right beside it, a beautiful translation of Lorca's 'Romance de la Pena Negra' by the same poet-translator. smells of stables and shadows. What's not to like about this edition of Cyphers, which also includes two compelling short stories, 'The Gods of Mud' by Mark Czanik and 'Natural Birth' by Peter Arnds, and a commentary on 'Literary Publishing In Ireland' by the editor herself, amongst its many gems? Mike Maguire, Manager of Limerick City Library (the Granary), will open proceedings. Here are a few thoughts on Surrealism, and the use of surreal images in painting and poetry, which I hope will whet your appetite for the occasion! Baguettes instead of fair-weather clouds in the sky, a man in a bowler hat with a green apple hiding his face, a floating boulder, men in pinstriped suits falling like a shower of rain, a panoramic scene ensconced in the contours of a tree, as if one could see through the trunk: these are some of the images from the paintings of Magritte that I evoke in my poem in honour of the Belgian Surrealist painter. (The Speaking Trees, page 4). Surrealism challenges our sense of reality by seemingly ridiculous associations: the chance meeting of a sewing machine and an umbrella on a dissecting table is the example which the founder of official Surrealism, André Breton, offered in his Surrealist Manifesto. Surrealism challenges our sense of reality by seemingly ridiculous associations, which are like the secret logic of dreams. It claims to access the unconscious mind where feelings and memories are often hidden away from ordinary life. like a patient etherised upon a table. This image is certainly surreal and also challenging to the whole concept of poetry that was prevalent at the time. You have the first two lines leading you to expect a typically lyrical poem, but your expectation is exploded by the third line. This was not the kind of thing expected of poetry! It has nothing to do with a beautiful sunset, the calm of evening, instead it evokes illness, something not right, something out of kilter. In this case it evokes Prufrock’s unease with his own life, and maybe as well it expresses Eliot’s sense of being out of synch with the kind of poetry that was prevalent at the time. Yes folks, We're off to San Fran to celebrate my 75th Birthday (I put 25th at first, surely a Freudian slip). We'll spend a few days in the old Hippie Capital, then move on to Oakland, where I will take part in the famed Studio One monthly Series of Poetry Readings, curated by Casey McAlduff and Sheila Davies Sumner. After that we will fly to Medford, Oregon, and be collected by the poet Allan Peterson, who read at Cuisle Limerick City International Poetry Festival a few years back. He will take us to be his guest in Ashland, where Bloomsbury Books will host a reading by me with music by Margaret. Then it's back to San Francisco for a couple more days and back home. By a curious coincidence, my two reading venues, Oakland and Ashland, chime in nicely with the title of the book from which I will be reading – The Speaking Trees. 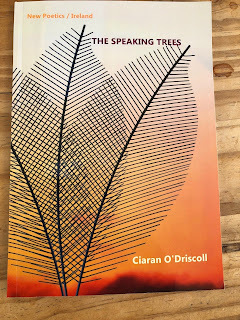 The Speaking Trees is a chapbook published by SurVision Books, Dublin. See www.ciaranodriscoll.com Poet and memoirist, with a first novel no longer skulking somewhere in publishers' piles, but actually now available in print and on Kindle, published April 2012 and called A Year's Midnight, after the first line of a poem by John Donne: ''Tis the year's midnight and it is the day's'. Lines from poems come into my head with a sense of enchantment. I also like skulking. As Carrie said in Four Weddings and a Funeral, If it comes to skulking, I can skulk with the best of them. I am getting to like gardening (aaargh!) Other likes are traditional Irish music, opera, and watching rugby, especially the Munster team. I also like getting away. A lot of my likes are retrospective, i.e. I was uncomfortable doing something or being somewhere, but recollecting in tranquillity, it was great and I even wrote a poem about it.